Last summer, after brushing off concert promoters for more than a year while they worked in secret on their next album, Phoenix got an offer they couldn't refuse: a headlining slot at April 2013's Coachella festival. 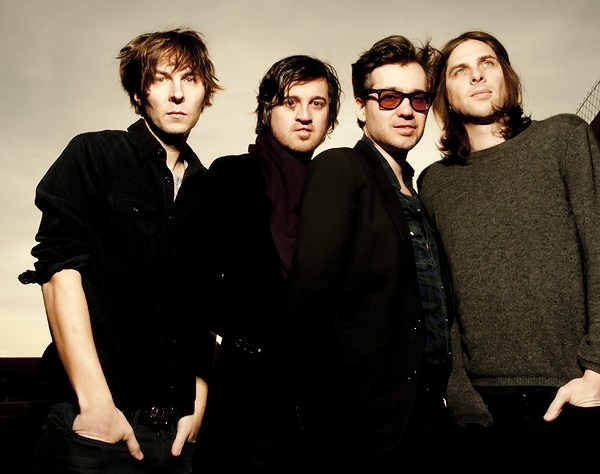 "That gave us a deadline for the record," says singer Thomas Mars. "Then we started to feel the pressure." "It was good!" adds guitarist Laurent Brancowitz with a laugh. "It's so easy not to finish things. We needed the fear." Lounging in a hotel penthouse suite overlooking New York's East Village, Mars and Brancowitz seem supremely relaxed now that Bankrupt! (due out April 23rd) is finally done. The way they tell it, Phoenix barely paused for breath between wrapping the world tour for 2009's Wolfgang Amadeus Phoenix, their fourth and biggest album, and starting work on the follow-up. "We are bad at taking holidays," Mars, who is married to filmmaker Sofia Coppola, says with a sheepish smile. Toward the end of 2010, the French foursome – rounded out by guitarist Christian Mazzalai and bassist Deck d'Arcy – dropped by Oscilloscope Laboratories, the downtown Manhattan film company and recording studio run by their friend Adam Yauch of the Beastie Boys. Generating more songs like "1901" and "Lisztomania," the aerodynamic radio hits that propelled Wolfgang Amadeus Phoenix to gold status, wasn't on the agenda. "We didn't want to make Ludwig Von Phoenix," jokes Mars. Instead, the bandmates pushed past their comfort zone, experimenting at raucous volumes on instruments including a cheap toy keyboard they'd found at a pawnshop in their hometown of Versailles. "You record for so long that you have no sense of what you are doing," says the singer. "I remember hitting, like, seven snares at the same time on a drum machine. That stupidity was possible because of the success of the previous album. We knew people would give it a few listens." In the spring of 2011, feeling homesick, Phoenix returned to France, setting up in a studio-equipped apartment in a seedy corner of Paris. "It was comfortable," says Mars. "There wasn't that pressure of being in a studio with gold records on the wall, you know?" Over the next year, they nailed down Bankrupt! 's 10 songs – from proggy visions like the seven-minute title track, whose burbling electronic intro blossoms into New Romantic majesty, to lush synth-pop starbursts like the lead single, "Entertainment." Even the catchiest tunes are more complex than they appear, with a psychedelic blend of live and programmed instrumentation swirling around Mars' vocals. "We tried to make it so you don't know if it's a drummer or a drum machine," he says, "a keyboard or a guitar." The band turned down some lucrative opportunities to keep working. "'Do you want to DJ this weekend in Switzerland for a crazy amount of money?' 'No!'" Mars says. Even brief breaks seemed inadvisable. "The best movie theater in Paris was next door, showing Badlands," says the singer, referencing Terrence Malick's 1973 classic. "I was so tempted – but I always thought, 'We can't waste two hours.'" Late last year, Phoenix moved to co-producer Philippe Zdar's home studio in artsy Montmartre, where they mixed Bankrupt! on the vintage console used for Michael Jackson's Thriller – the band picked it up on eBay for $17,000. "We didn't even look at the expense," says Mars. "It made the studio moments even more exciting." Next, they'll ease into touring with a string of U.S. dates leading up to Coachella. And while the disc is front-loaded with stylish hooks, Phoenix are still unsure U.S. radio will respond. "The fact that the last record was successful – we consider it a collective hallucination," Brancowitz says. "So we're not afraid."